I visited a county surplus warehouse this week and stumbled across a large chalkboard hanging at the top of the wall. It must have been used by the Orange County Registrar of Voters once, to keep track of the vote counts as each precinct reported in on election night. It's divided with strips of tape, with the candidates' names on the left and the vote counts on the right. When I got close enough to actually READ the names, I was rather surprised. This chalkboard hasn't been touched since election night 1970! A close-up of one portion of the chalkboard. The names on the board are quite a who's-who. For starters, Ronald Reagan defeated Jesse "Big Daddy" Unruh to win a second term as governor. And the son of former governor Edmund G. "Pat" Brown -- a kid named Jerry Brown -- was elected Secretary of State. 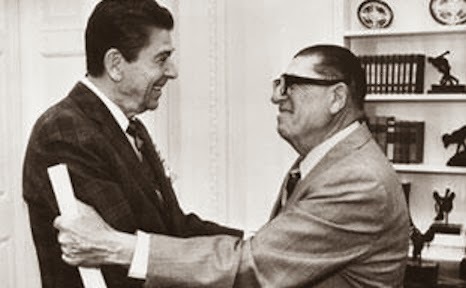 Over a decade later, Reagan and Jarvis meet at the White House. Democrat Assemblyman (later State Controller) Kenneth Cory won reelection with the support of friends like Richard O'Neill. Interestingly, (at least to me), Cory's mother, Jane Gerber, was a great supporter of local history, and served on the Orange County Historical Commission in the 1980s. 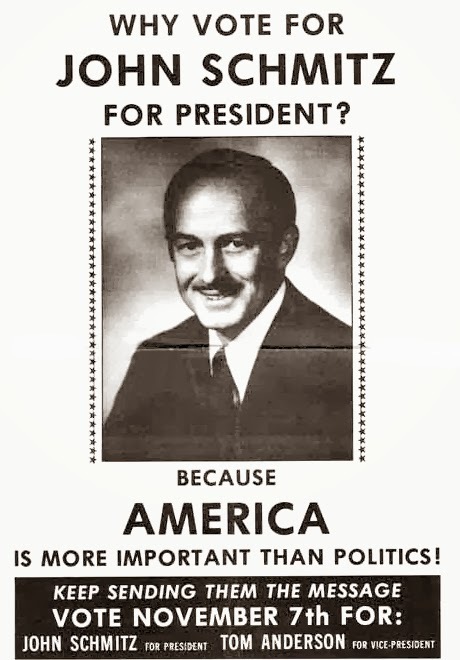 Cory beat Republican challenger Bruce Nestande, a one-time protege of Reagan. Nestande made it to the Assembly a few years later and served there for three terms before being elected to the Orange County Board of Supervisors. As a young man still waiting for his political ship to come in, Nestande was given a job by fellow Republican Walter Knott as the manager of Knott's new Independence Hall (replica) attraction. 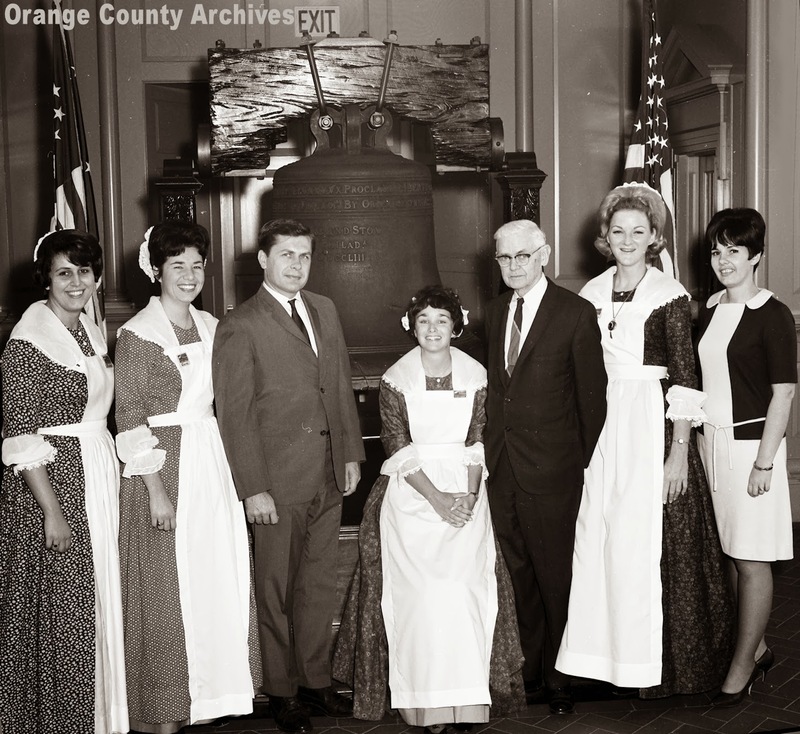 Nestande, Knott, and quasi-Colonial lasses at Knott's Berry Farm's Independence Hall, 1967. Ralph B. Clark, who owned a gas station at La Palma and Magnolia in Anaheim, won the first of his four terms as County Supervisor on the night the chalkboard was last used. He pushed for responsible development, county parks, and our transportation infrastructure. He's largely responsible for our county's OCTA bus system, and he led the effort to bring the L.A. Rams to Anaheim. 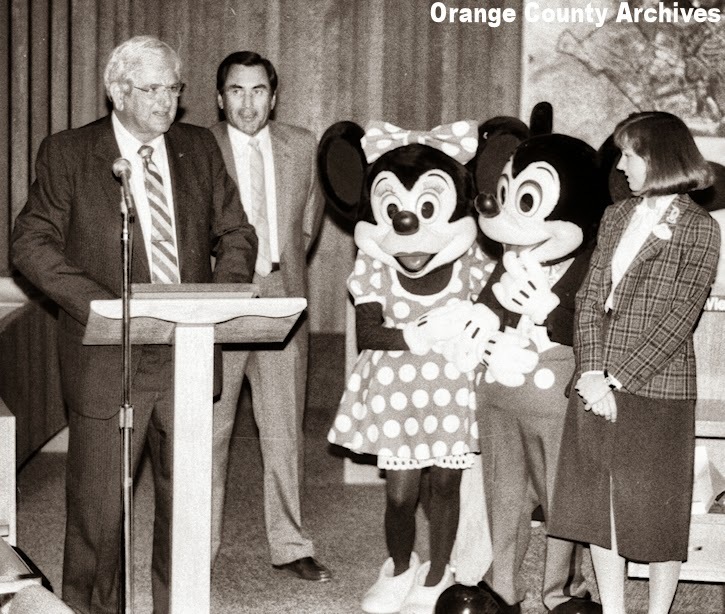 Supervisor Ralph Clark introduces Mickey and Minnie Mouse. Korean War veteran and longtime Balboa resident Robert E. Badham, was reelected to the State Assembly. He would later serve in Congress, where he was a member of the House Armed Services Committee. A fiscal conservative, he believed in protecting our natural resources and our coastline. I hear he also played a mean tuba. I'll probably write more about Schmitz in a later post. Another familiar name on the chalkboard was Robert Citron, who was elected County Treasurer for the first of many times that night. Although he consulted psychics and astrological charts, Citron apparently couldn't foresee his role in steering the County into bankruptcy in 1994. As county government reeled, he pleaded guilty to six felony counts and was sentenced to a year of work release, five years of supervised probation, and 1,000 hours of community service. Strangely enough, Citron's father, Jesse, was the homeopathic doctor who supposedly convinced W.C. Fields he should give up scotch before it killed him. If karma worked, a drunk comedian would have convinced Bob to finally give up investment pool management before he bankrupt the county.